Roots for Peace Internship: Now Online! The Roots for Peace Internship online application is now open for LHS students! Are you a senior or a junior in Lincoln High School? Do you have an open 8th period and would like complete your service learning or community service hours? Then the Roots for Peace internship might be for you! 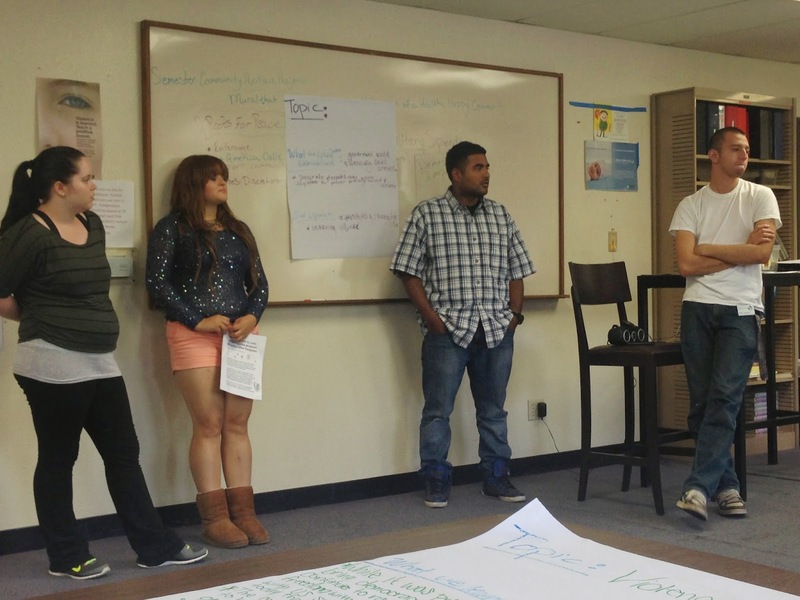 Build leadership skills and social justice awareness related to food access, community health, nutrition, and land use in your community. To apply online, click here! We look forward to reading your application, please text or call Eli at 818.383.6434 for more information or questions. 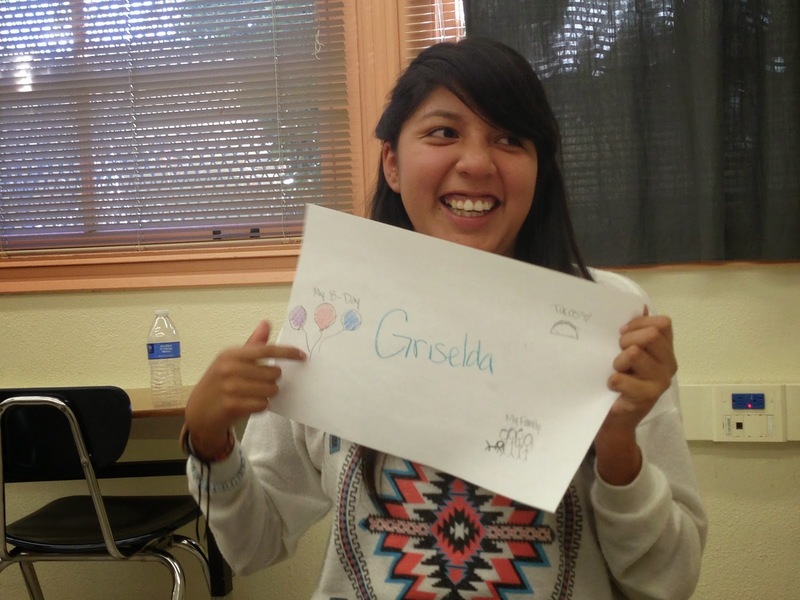 Griselda drew three things that she loves; her birthday, her family, and tacos! 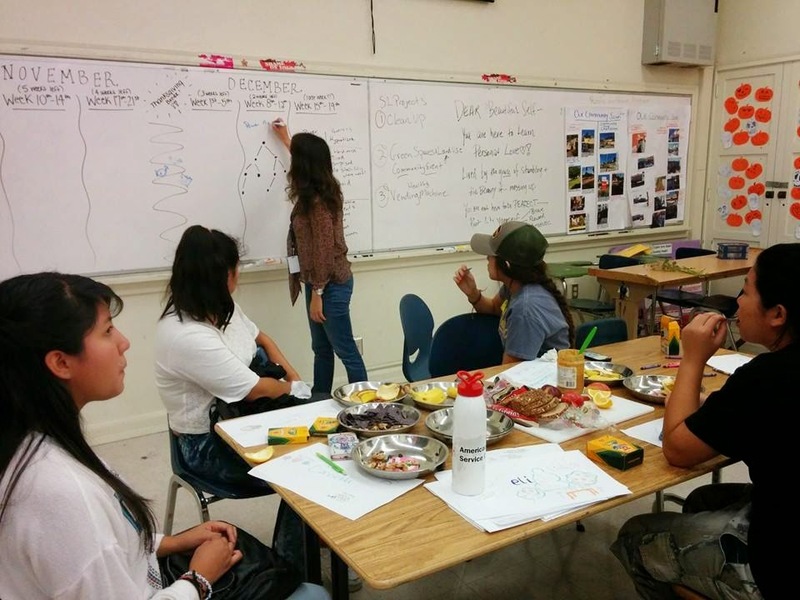 On Nov.4th we were able to meet with Griselda, Jenny, and Jasmine, and students at Lincoln High School to discuss what service project they wanted to plan next. But before we dived into planning, we played a little game that enabled us to get to know each other a little bit more. Each of us drew our name in the middle of a piece of paper and then drew three different things in our lives that we love. Griselda (pictured left) shared with us that she loves her birthday, her family, and tacos! When we began discussing with the students what their ideas were concerning their next service project, they agreed that they wanted to participate in organizing a COMMUNITY CLEANUP! Before confirming, we first wanted to acknowledge the power dynamics of those who make it possible for the streets to be dirty in Lincoln Heights. Crystal discussing how power is distributed and discussing realistic goals for our cleanup day while we were snacking on some tasty snacks! 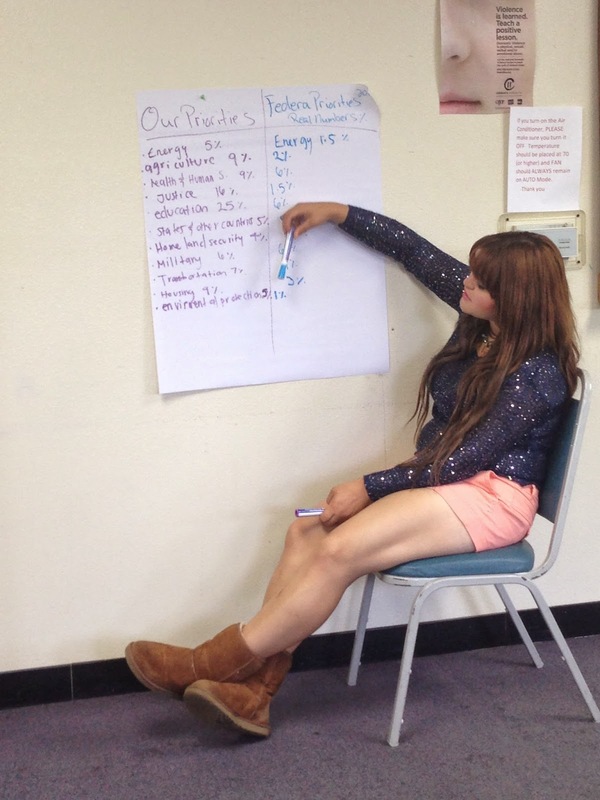 With support from Crystal, the students began to acknowledge how power is distributed in the community in order to understand how effective a community clean up can be in building a healthy community. As Jenny explained, “Well if we clean the streets for one day, they’re just going to get dirty again”, which I found to be a very true statement! As a group we are able to realize that although cleaning the streets once isn’t a permanent solution we are working towards impacting the value that the community has on the cleanliness of their streets. Not only do clean streets create more of an appealing environment, but they also promote the overall health of the community. Dirty streets could contain harmful chemicals, bacteria, and even cause community members to injure themselves if the litter isn’t seen in time. Through all our discussions I have come to realize that the only way for us to be able to create sustainable solutions for the garbage left on the streets is for us to attempt to raise awareness in the community about how this litter is affecting our physical, emotional, and social economic health as a city. Bringing awareness to your family and friends that littering truly isn’t helping your neighborhood is a great place to start. Another possible solution is for there to be more trash cans available for people to use on the streets. People may not feel the need to throw the trash else where if there are more trash cans readily available for them. We could also attempt to motivate families to recycle and/or create compost bins thus hopefully decreasing the amount of waste disposed of improperly onto the streets. A factor that may increase the amount of dirty streets in the neighborhood is the idea that certain streets are being skipped over by street cleaning services due to the intense amounts of garbage covering the streets; there may be benefits for us, as a youth community, to talk to our community leaders and discuss how this problem may be solved. Although there are many things that we, as individuals, can do towards creating sustainable solutions we must work as a team if we really want to see positive results! Jasmine admitted she was one of those people that leave their trash on the ground sometimes, but she thinks it’s because there are not that many trash cans on the streets and it’s a lot easier to just leave it there. The students were able to talk about what they, as residents of this community, could do to create a more enjoyable living environment and what news they could share to others that would motivate them to do the same. Knowing that this was not an action that would solve our problem, they still wanted to host such event and understood the benefits and limitations to cleaning up the streets with other committed students. 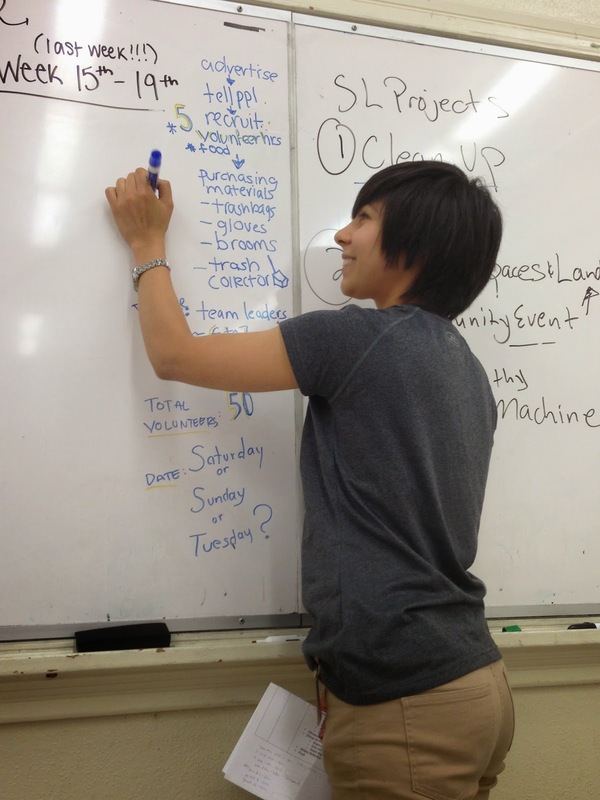 Eli writing our plan of action for the cleanup day! Next, we created an action plan for our Community Clean-Up. First, we would advertise the event verbally to recruit students to participate. Team leaders would recruit 5 people each and would give an update next week. We would provide food and community service hours to those that participated. Last, we made a list of what materials were needed for this event to be carried out. As we looked at the date for the event and how many weeks are left in our internship, many of us were surprised to realize how fast the semester is flying by! 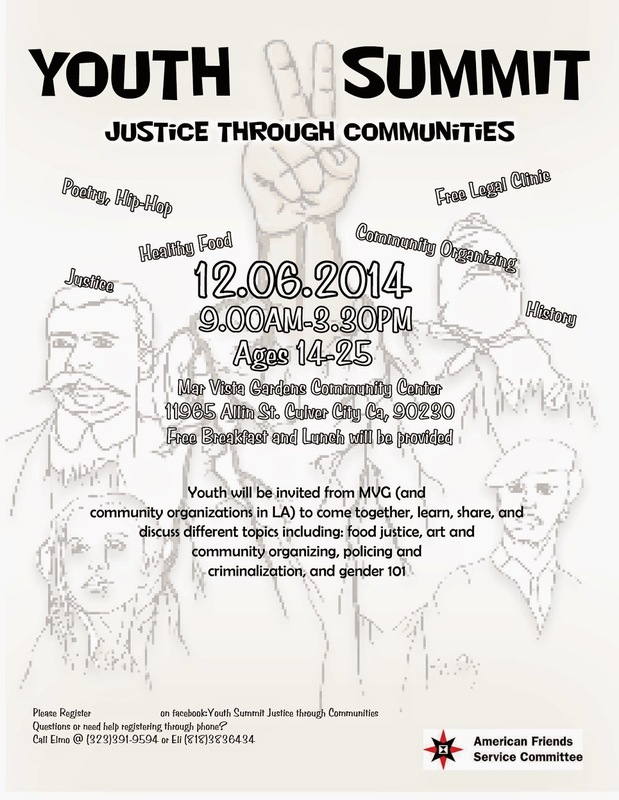 If you are a youth from age 14-25, join us in this upcoming Youth Summit in Mar Vista Gardens this upcoming Saturday! Click on this link to support this event! Los Angeles…Presente!! Sur Africa…Presente!! Palestine…Presente!! My name is Elmo Gomez with AFSC’s “Roots for Peace” Program in Los Angeles. After participating in the Global Youth Peace Indaba (dialogue) in post-apartheid South Africa It is clear how the truth and reality around post-segregation America is not that far. Capetown, South Africa was a Strategic location to hold these conversations with people from around the world. The reality and the consequences in the lack of investment in the peoples’ long term needs is reflected in places like across my street here in Los Angeles and nationwide. To see the structure change but to see on the ground how conditions are still familiar and how black and brown working class members still resist impoverished, heavily policed and colonial conditions is parallel. The conversations held at the Indaba clearly detail what the results of investment can recreate in the aspects of healing, rebuilding, and moving forward towards a better future. People shared their experiences and expressed their right to self-determination and what it meant to retain their identity even while being continuously occupied and colonized, became an educational experience for many. As the conversations go on about how to bring peace to a community and resist all forms of oppression, we continue that work here in our soil through gardening and education in AFSC’s Los Angeles’ “Roots for Peace” program. The Roots for Peace program, is a form popular education in Los Angeles has run a as developing model for the past 6 years to support the communities’ long term needs. We see how Land, Identity and Food play a large role in self-sustainability. Nevertheless when including Social Justice and the communities’ right to self-determination as leading factors, we must shift the paradigm of the praxis daily, knowing that Theory and Practice will bring the cycle of struggle-unity-struggle full circle to address the communities’ long term needs. Praxis is the overall creating of a structure of communication, planning and maintaining different forms of dialogue which evolve to meet the very needs of the community and not the goals. As we do here in Mar Vista Gardens. Have you ever stopped and really looked at your community and wondered what you could do to help make it a better environment? 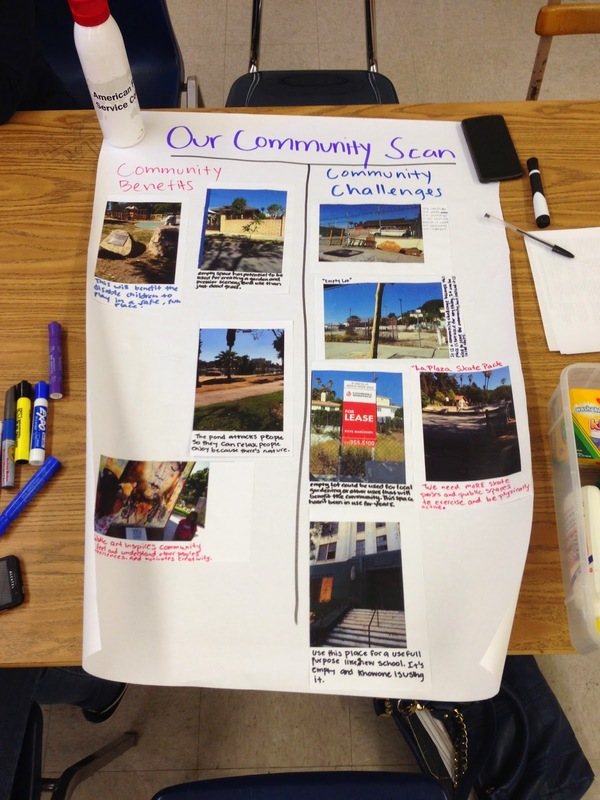 Well, on Oct. 28th Lincoln High School students went around their neighborhood took photos of specific areas in the area that represented what they believed to be community challenges and community benefits. It was interesting to see what the students chose to take photos of and how in depth their explanations were when they spoke about the photos they chose. Annett and Olivia organizing photos on the poster! 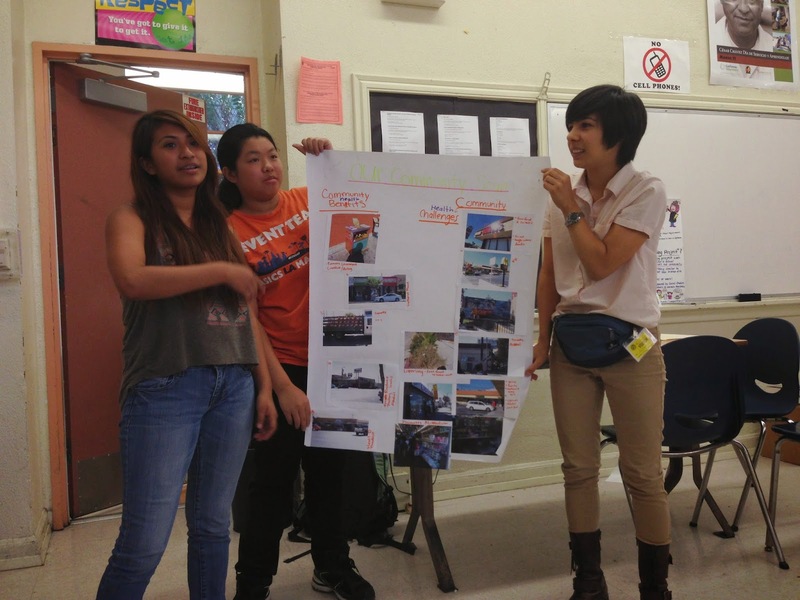 The students’ photos included areas such as empty lots, trash on the streets, and abandoned housing. Students also discussed their dislike of an abandoned prison building in Lincoln Heights and many were surprised of the toxic chemical asbestos that was located in the walls. This is not only a waste of space in Lincoln Heights, but it is also a health hazard in the community. On a brighter note, Araceli, explained that she appreciated Lincoln Heights park because individuals and families were able to sit, relax, and enjoy the scenery of nature even though they live in the middle of a fast-paced city. Aneht, Jenny, and Eli presenting their “Our Community Scan” poster! Aerial view of one of the “Our Community Scan” posters. Olivia discussing her thoughts on some community benefits. Crystal, Olivia, and Araceli adding one more photo and the finishing touches to their presentation. In the next week or so the students will be deciding on one specific topic for them to be able to work on together for a final class community project. After we had finished discussing the students’ suggestions for their possible future project, it was time to eat some snacks! (From left to right): Eli, Zanetta, Araceli, Jenny, Crystal, Jennifer, and Olivia. It was so delightful to being able to just sit and talk with these students about not only their thoughts on things that they had viewed in their community, but also just to check in with them to see how they were doing with school and anything else they wanted to talk about. I’ve had such a blast getting to know each and every one of these students and I’ve learned what examples of true positivity looks like from these amazing women. I feel so blessed to be able to learn alongside them; it’s wonderful for us to be able to think of creative ways to enrich their learning experience and brainstorm ideas for us all to cater to the needs of the Lincoln Heights community. If you want to find out what topic they decide to do their final project on, be on the look out for more future blog posts to stay updated! Please check out our facebook as well for more pictures from Lincoln High School and other Roots for Peace sites! On Oct. 9th, 2014 we visited All People’s Community Center for our weekly meeting with a group of wonderful students. The first activity that we did was an activity in which we asked the students to pretend like they were given all of the money from our whole country’s fund; for the sake of the activity the funds were a collection of 100 pennies. They acted as congress representatives and had the opportunity to put their 10-13 pennies in whatever area that was important to them. The categories that they could fund included agriculture, energy, homeland security, military, environmental problems, education, housing, states and other countries, justice, health and human services, and transportation. They were asked them to put their money where their priorities were and where they believed our government’s funding should go. and actual percentages of government funding. One of the students, Brenda, had said, “They always have money for the war, never for the poor”, which she had later told us that this line was from a Tupac song but she couldn’t help but think of those words when she had found out that 60% of the government’s funds were going to the military. After the exercise, another student, Jasmine, said, “..more money should definitely be going towards education. Brenda writing down thoughts from her group onto their poster. Later on, the students split into two groups and discussed the international impact and domestic impact that large amounts of military funding had done on a local level and the impact it has had overseas. funding has had on their local community. 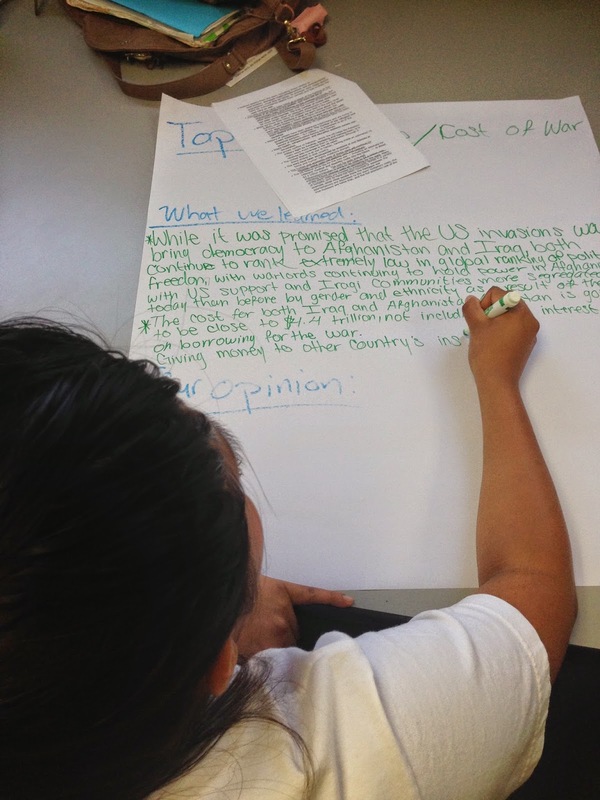 The students then created posters that explained what they had learned and what their opinion was after reading the articles that discussed government funding and watching a video that explained some issues that arose from immense military funding with the use of satire. For example, the students discussed about how a quite a lot of military funding goes to the LAPD and LASPD which allows them to gain access to weapons that look as though they belong on war grounds, such as 14 AR-15 assault rifles, grenade launchers, and MRAP armored vehicles (used to keep troops safe in Iraq). It was extremely inspiring to listen to whateveryone shared about the government’s financial choices. Many of them want money to go into education and many of us rightfully agreed. There seems to be a very large imbalance in the distribution of funds and although it seems impossible to change, learning more about our society and government’s choices can help us know where to start and how to create an environment that is fair and peaceful in this and other communities across Los Angeles. For more information on military grade weapons given to the LASPD click link below. On October 2nd, 2014 we were able to go and spend time with a wonderful group of students at All People’s Community Center. Through different “get-to-know-you” activities we had some fun and built relationships with each other. The students were kind and willing to dive into whatever activity we were planning to do on this day. 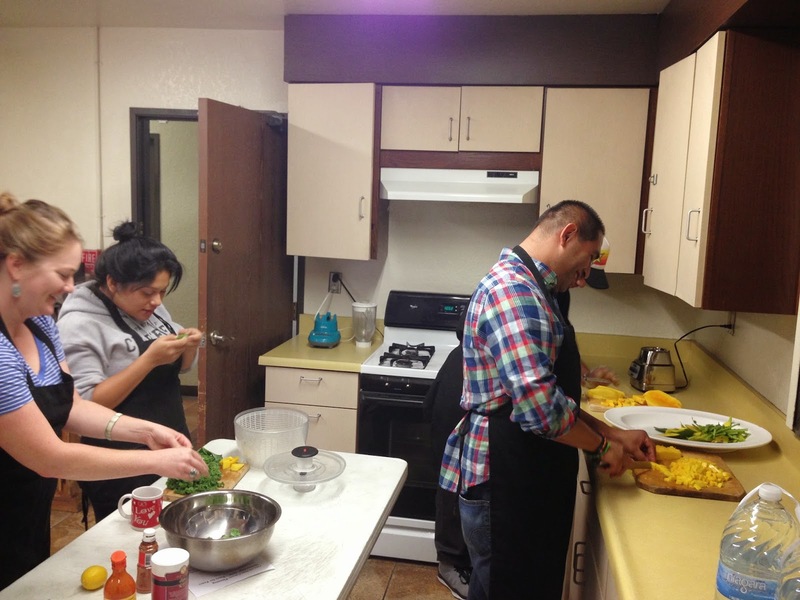 The group of students split in half; half of the group prepared to go outside to the garden with Crystal, while the other half came inside the kitchen to learn how to create a meal from scratch. 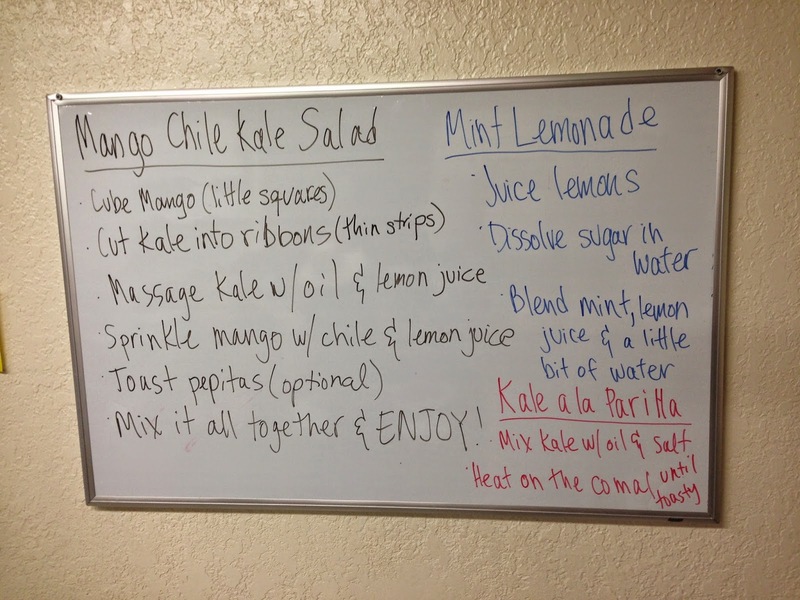 Our recipe of the day was Mango Chile Kale Salad. This salad mixed sweet and spicy for an absolutely perfect combination of both. We were also able to create fresh mint (and spinach, shhh!) lemonade we had created as well. 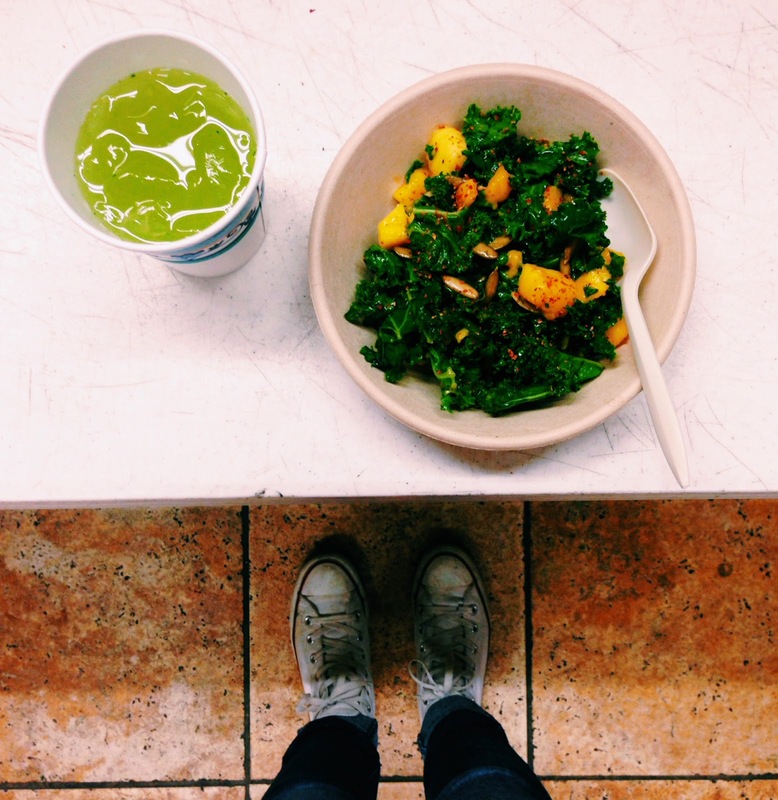 Lastly, to add a little tanginess to the meal we created Kale “a la parilla” (kale chips), made by taking fresh slices of kale sprinkled with oil, salt, and fresh lemon and lightly frying them over a warm stove. 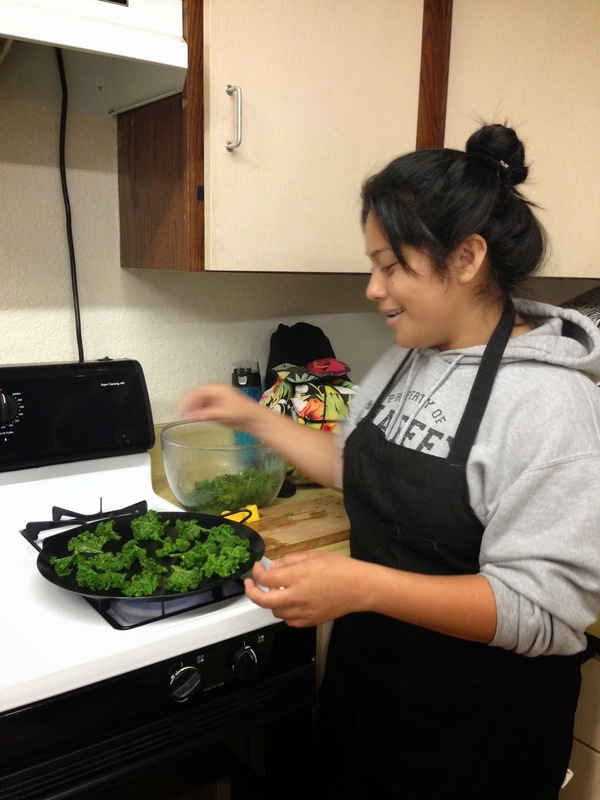 At first, the students were hesitant on trying a salad made from kale, but when they finally were able to taste it they actually really enjoyed it and came back for more! It even amazed the students that the kale and mint that we had used to create this salad was fresh from the garden outside. Mix it all together & ENJOY! Oscar and Rios slicing and dicing mangos into small pieces to add the sweet factor into the salad. Jasmine waiting for the Kale chips to be ready! 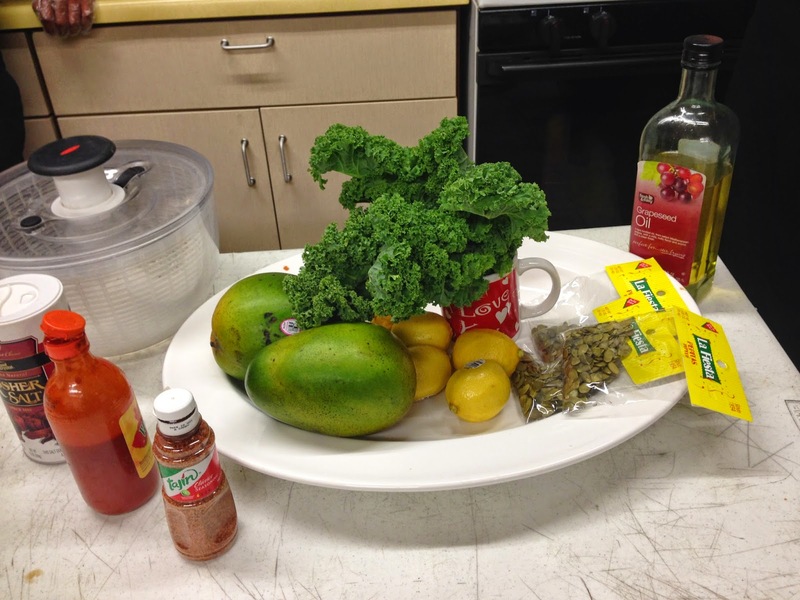 Elisa, Jasmine, and Rios prepping the ingredients for the Mango Kale Salad. 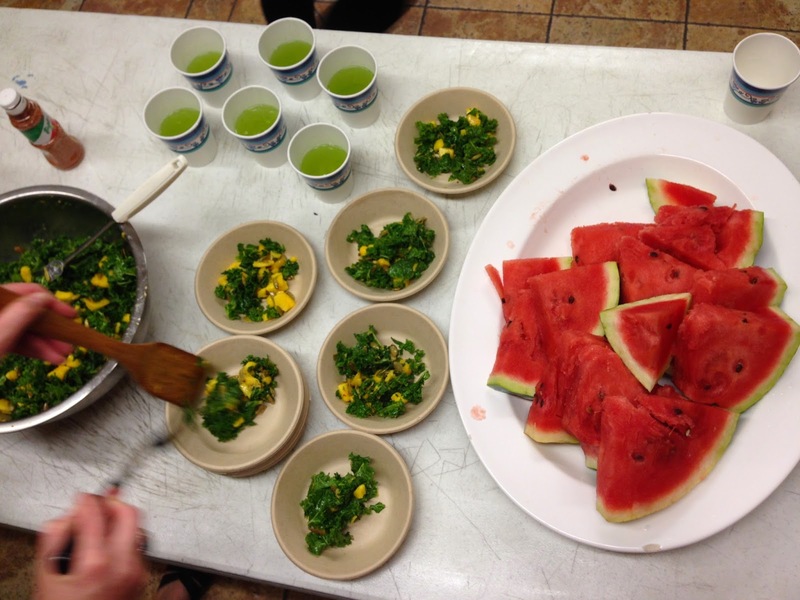 Preparing the salad, watermelon, and mint and spinach lemonade to hardworking and hungry students. It was so great being able to really get to know all the students through silly talks in the kitchen while cutting up ingredients for the salad or weeding outside in the garden. It’s amazing to be able to show the students through discussion and hands on practices that you don’t need a lot of sugar or preservatives for something to taste great. In our modern society most of the food that we buy from a store usually includes food colorings, artificial flavors, large quantities of sodium and processed sugar; it’s almost rare to find food that is truly organic or fresh! “The Center for Disease Control & Prevention has stated that 75 percent of healthcare spending goes to treating preventable chronic diseases, most of which are diet-related” (“Eat Healthy”). We are able to keep our bodies healthier when we choose to eat foods that have long-term benefits. In LA 58% of adults are overweight or obese (“Shocking Healthy Eating Statistics”). When fast food and unhealthy food options are readily available for us, we must learn how to find foods that will give us the daily nutrients we need. We also discussed urban sustainability and how it truly is possible even in L.A. The students decided to try the salad even though they hadn’t tasted it before and they were actually surprised with how much they liked it! It inspired me to go out and try new foods even if I’m uncomfortable with it at first because you never know what will taste great and be great for you! Through creating relationships with the youth in our community we are able to show them different alternatives of food choices that taste good and make us all feel good. Plus we are able to learn so much from every single amazing student we are able to spend time with. I am looking forward to all the other activities we have planned ahead! “Eat Healthy.” ChooseHealthLA.com. County of Los Angeles Public Health, n.d. Web. 21 Oct. 2014. “Shocking Healthy Eating Statistics.” The Healthy Eating Guide. N.p., n.d. Web. 21 Oct. 2014. Meet the Intern for Spring 2014! Hello I am Alicia Davalos, the latest Los Angeles AFSC intern for Spring 2014! I am currently a sophomore at Azusa Pacific University, studying Global Studies with a minor in TESOL. Everything that has to do with humans and their culture energizes me. I love learning about people, their cultures, their backgrounds, and their religions. People are so beautiful in their own unique way and I think that is the reason I want to work with people for a living. I desire to be able to comfort people in any possible way and support them especially in their times of need. As a career I hope to do this by working for a non-profit organization and teaching English as a secondary language to students. I love the mission that AFSC is driven to succeed and I am so glad I get to be apart of it. My heart has always focused on social justice issues like human trafficking, and homelessness; but AFSC has opened my eyes to issues like food injustice; something I would have never acknowledged if it weren’t for this internship. Being able to work with students and help teach them how to become aware of these issues and how to garden so they can make their own healthy foods will be a wonderful experience. I love being able to see students become motivated and come together in one community to garden or participate in a variety of activities. I am eager to continue to learn about food justice issues and how we, the community, can be the change we want to see. On February 2nd, 2013, I was at the lowest point of my life. I was suffering from agonizing anxiety and debilitating depression. That night, I was admitted into a mental hospital and placed on a 72-hour involuntary hold. It was the most difficult, trying experience I’ve ever faced. I felt hopeless. When I was finally released, I was engulfed with uncertainty. I did not know what I was going to do, but I knew things had to change. I could not continue living life the same way, without purpose. In all honesty, that was not truly living. I needed something positive, something meaningful. I am glad to say I found it. Around March, I visited my old high school, Central High School/All Peoples. I felt that would be a good place to begin my road towards a better life. I was not disappointed. While I was there, I found that the garden program was still alive and well. That made me happy. At that moment, I knew there was something right in front of me that I needed to be involved in. I went home that night feeling particularly optimistic. From that day forward, I volunteered in that garden, doing anything and everything I could to help. It began with one or two days a week, then it was two or three, eventually it became entire weeks. The more time I spent there, the happier I was. I didn’t know at the time, but there was something about gardening, something special. Gardening is not just a pastime. It is a powerful tool and an influential act. For me, it was a means to reclaiming my life. But it wasn’t just the gardening, it was the community that was built through it that had the greatest impact on me. I believe that this is the beauty of it, the most influential part. It is an amazing thing to see people come together and work towards a common goal; building community, transforming neighborhoods, and so much more. Gardening allowed me to see that. It is now December, ten months later, and I have not once looked back. I cannot express how grateful I am for what gardening has given me, for the people it has allowed me to surround myself with. It has been a surreal experience. 2013 began as the worst year of my life; gardening has made it the best. —— Jorge volunteers for All Peoples and the AFSC on a weekly basis. Jorge recently became Victory Garden Certified and will be applying to LA’s 2014 Master Gardener Program. This creative analytic, Amber Buchanan, finds great joy in the simple details involved in inspiring the great diversity in our world. Growing up in the unknown desert of Washington State, simplicity defined me, but interesting enticed me. As a student at Azusa Pacific University pursuing my bachelors in Global Studies, I am intrigued with experiencing different cultures. My recent experiences include living and working in Kona, Hawaii and immediately after moving to live this last summer in Naknak, Alaska working at a fishery. No culture is too obscure for my desire of understanding the world. I plan to cultivate diverse routes of thinking in a desire to write about my findings and share these new perspectives with those who do not have the chance to experience it themselves. In this endeavor, I plan to raise awareness of our differences by extinguishing the fire of hate and igniting a new love for humanity. I long to interpret diversity through the gathering of stories. What better route than growing food and health awareness together. Gardening and dirt brings me back to my roots and I am excited to see where AFSC’s story and my story can grow together!